In the medieval period Endsleigh formed part of the estate of the abbots of Tavistock, and had been given to the Church by the Edgcumbe family of Cotehele, Cornwall. In 1540, the abbot’s 15,000 acre estate was granted to John Russell, first Earl of Bedford. The abbots of Tavistock had a hunting lodge at Leigh Barton, south-east of Endsleigh, but after the Reformation it fell into disuse, and no permanent residence was established on the estate until the early C19, when John, sixth Duke of Bedford decided to replace ‘an irregular farmhouse little better than a cottage’ which existed near the site of the present house. In 1809 Humphry Repton (1752-1818) and his sons John and George produced a plan and three perspective watercolours for a cottage residence at Endsleigh, but these were abandoned in favour of a scheme by Jeffry Wyatville (1766-1840). The guiding spirit behind the development of Endsleigh was the Duke’s second wife Georgiana, whom he married in 1803, the daughter of the Duke and Duchess of Gordon. 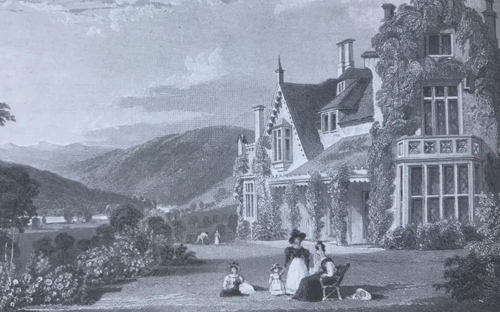 The Duchess (d 1853) was familiar with two Scottish cottages or lodges belonging to her parents, and it has been suggested that these connections encouraged her to exploit the picturesque potential of Endsleigh. The house was begun in September 1810, with limited work on the grounds taking place between 1810 and 1814, probably to plans by Wyatt. In May 1814 Humphry Repton was consulted on the design of the grounds, and visited the site in August. His proposals for the creation of an extensive picturesque landscape were presented in the form of a Red Book which was completed in late 1814, while a further account was published in Repton’s Fragments. Following Repton’s death in 1818, Wyatt continued to design new structures for the landscape, some of which, such as the ruined Abbot’s Castle, were not implemented. Despite depleted finances following the sixth Duke’s death in 1839, further developments were made in the grounds during the 1830s and 1840s. A series of paintings by J C Bourne show the grounds as they were completed. Endsleigh continued as an occasional residence for the dukes of Bedford on their West Country estate, and in the early C20, Herbrand, eleventh Duke of Bedford made significant additions to the landscape. Following the death of the twelfth Duke in 1953 in a shooting accident, the estate was broken up. Endsleigh was sold in 1961 to a fishing syndicate, which runs the house as an hotel. Three landscape structures, Swiss Cottage, Pond Cottage and the Dairy were sold in 1977 to the Landmark Trust, while in 1989 the house, gardens and pleasure grounds were vested in a Charitable Trust. Restoration of the buildings was begun in 1987, and a major landscape restoration programme was initiated following serious storm damage in 1990. In 2004 Olga Polizzi bought Endsleigh and together with her daughter Alex restored it as a luxury hotel. Olga Polizzi almost didn’t buy the Endsleigh estate when it came on the market ten years ago: “Someone told us about this amazing house and extraordinary garden with follies, so we went to see it on the way to Cornwall and loved it, but thought it was too much to take on.” After reading an article, saying the property should be saved for the nation, she went to see it again and… “Rather stupidly, I bought it, more with my heart than my head, but every time I go there I fall more in love with it.” She’s not the first one to feel that way. Built as a country retreat for the Duke and Duchess of Bedford and their brood of 13 children, the house was designed as a picturesque “cottage orné”- a modest and rustic retreat in stark contrast to the family’s main residence at Woburn Abbey. Humphry Repton, the most famous landscape designer of the day, was duly commissioned. By then he was approaching the end of his celebrated career and, having been injured in a coaching accident, was carried around the estate in a sedan chair to draw up his plans. He presented them to the Bedfords in the form of one of his trademark Red Books. A facsimile is on display in the hotel lobby. It’s a fascinating handwritten record of his ideas, interspersed with delicate watercolours with overlaid panels to show “before” and “after” views. Repton himself features in some of the paintings, overseeing the work. Not all his design ideas were carried out at Endsleigh, but many were. He sought to manipulate but not dominate the landscape’s natural beauty. Something he pulled off with aplomb. Olga’s daughter Alex Polizzi managed the project to turn the house into a hotel. Where once there was a team of some 30 gardeners, now the 108-acre estate is managed by just three (and one part-timer)! They’ve been rediscovering features of the garden obscured by overgrown plants and gradually restoring them. “It’s a very special place”, says Olga. “There are few places like this these days and that’s why we took it on. There’s no light pollution, aircraft or traffic noise so you can see the stars at night, hear the birds and the flowing river”.